This attractive handbag rack can hold up to 20 handbags. Includes four angled J-Hook arms with five hooks. 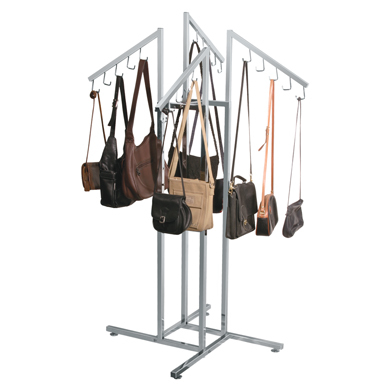 Handbag rack is also great for displaying scarves using accessory clips, item 5023. Add optional sign holder, item 1249 and casters, Item 1030 for easy mobility. Arms easily assemble into base for quick set up and take down.